The Coveo Platform offers a set of on-premises Coveo products and modules designed to operate together to index multiple enterprise repositories and create a unified information access system. The following diagram presents the high-level architecture of a Coveo on-premises infrastructure that would integrate all available products and modules. 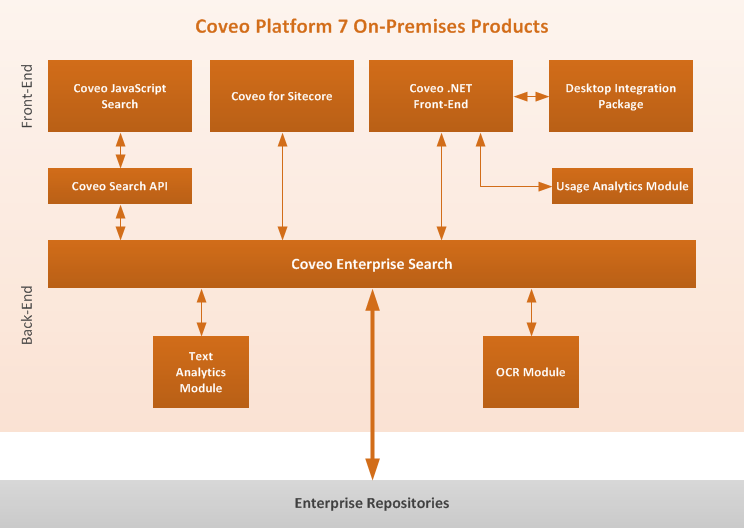 Invisible to the end users, Coveo Enterprise Search 7 (CES) is the backbone of the Coveo Platform that connects and continuously crawls your siloed enterprise repositories to create a unified index of your enterprise knowledge. CES receives queries from front-end search interfaces, consoles, and dashboards and returns contextually relevant results within one second (see Coveo Enterprise Search 7.0) . End users of Sitecore powered websites can get contextual and personalized search results when Coveo for Sitecore is integrated to Sitecore 7 (see Coveo for Sitecore 3.0 or Coveo for Sitecore 4.0) . Providing search interfaces to end-users, the Coveo .NET Front-End module offers a set of out-of-the-box full-featured search interfaces. An administrator can use the Interface Editor to customize the interfaces to match the organization needs and branding (see Coveo .NET Front-End 12.0) . With the Desktop Integration Package, end users can search Coveo unified index content from the Coveo Searchbar floating on the Windows desktop and from the Coveo Sidebar in Microsoft Outlook. They can also index content stored on their local workstation to make it searchable along with other content (see Desktop Integration Package). With the optional Usage Analytics module, administrators can set up an on-premises database to record the usage of the Coveo search interfaces. They can then use the Analytics module user interface to review search usage to help optimize and increase adoption of the Coveo information retrieval solution (see On-Premises Usage Analytics Module) . Administrators can use the optional Text Analytics module to create additional metadata by extracting and indexing themes and named entities from unstructured documents and enable end users to more easily filter and consolidate data from diverse sources (see About Multi-Channel Text Analytics). Administrators can use the Optical Character Recognition (OCR) module to extract and index text from images and scanned documents to make them searchable by end users (see OCR Module) .